From Snowboarding To Droneboarding: Recipe For New Sports? Just Add A Drone : All Tech Considered You may have heard of drone racing, but people keep coming up with new ways to enjoy these flying machines. A Latvian firm has developed a drone to pull snowboarders in a sport called "droneboarding." 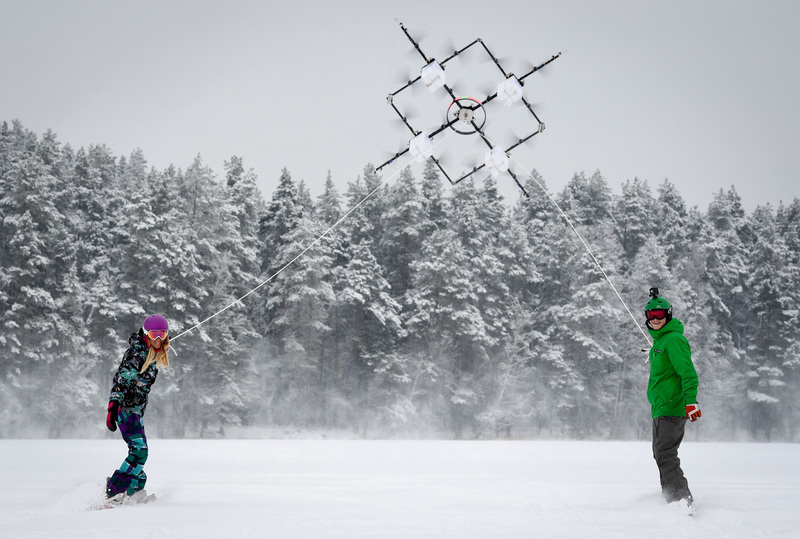 Snowboarders are pulled by a drone on a lake near Cesis, Latvia, in January. You may have heard of drone racing, but people keep coming up with new ways to enjoy these flying machines. One of the latest twists on drone sports comes from Latvia. A company called Aerones has developed a drone to use for droneboarding, a new sport that's just what it sounds like — a snowboarder being pulled through the snow by a powerful drone. When the company first tried droneboarding last year, as a way to test the strength of its drones, the sport didn't even have its name. "We didn't call it like that in the beginning, but somebody, somewhere said droneboarding, and that's how it took off," Aerones CEO Janis Putrams says. The company posted a video online, which Putrams says had 5 million views in the first couple of weeks. He says the company wanted to use drones to wakeboard as well, so it built a larger, more powerful drone capable of lifting 145 kilograms (about 320 pounds). So when the AFP news agency approached Aerones about a year later and asked to do a story on the sport, the company decided to go big — four times bigger. "When we do this kind of a test, we want to do something new — something that we haven't done before," Putrams says. "So we thought, 'Well, the drone is four times bigger than last time, so let's try four snowboarders.' "
AFP and Aerones released videos of the feat. Putrams helped to pilot the drone using remote controls, but he said the professional snowboarders who were towed were very excited about the way it felt. In another instance of droneboarding caught on camera, a child in a January 2016 video gives it a try, albeit at a much slower pace. And if you want to feel like you're really a part of the action, take a look at this 360-degree video of droneboarding. Putrams says droneboarding — and the use of drones in sports — probably isn't going away. "In terms of sports, I think it's here to stay for sure," he says. "We did it last year, and it went viral, and we did this winter, and it went viral again." He says the company may try to integrate the control in the handlebar so there would be no need for a pilot to operate the drone. Drones have been used for other sports too. The Drone Racing League has attracted participants from around the world. Using remote controls and virtual reality glasses, pilots race drones through courses with a variety of obstacles. In September, the league signed a deal to be broadcast on ESPN. And in activities leading up to this year's NFL Pro Bowl, players participated in a "drone drop" skill challenge — catching a football dropped by a flying drone. It's worth noting that for recreational use, the Federal Aviation Administration restricts drones from flying above 400 feet as well as flying over sporting events or stadiums. Putrams says his company isn't just interested in drones for sports. Aerones' biggest goal, he says, is to use them for firefighting and human rescue. The company has figured out a way to have a drone pick up a hose and point it toward a burning building, reaching areas too high for a ladder. A power cable can be added so the drone is not limited by time or batteries, Putrams says. And because of the lifting power of the drones, Putrams says they could be used to rescue people trapped on a roof or on an icy lake.